Audio There are 4 products. A cool promotional item that won’t break your company’s budget? Sounds like music to your ears! These custom-branded, high-tech audio products from Sutter’s Mill Specialties are just what you need to let the good times roll. How about a wireless Bluetooth speaker, laser-engraved with your logo? For something a little smaller, check out our personalized earbud headphones, available in multiple colors. No matter the occasion, these audio items will hit all the right notes. This portable, personalized tech device allows you to play music or make calls wirelessly through any auxiliary port. 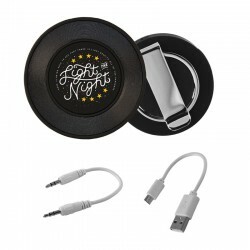 This stylish, personalized travel case contains your laser-etched logo and comes with a set of white earbuds. This personalized travel case has a beautiful grey velour exterior that displays your laser-etched logo. It also comes with a set of multi-function white earbuds. These earbuds feature an in-line microphone, volume control, and a play/pause, answer/end call button. They also have a tangle-free cable and come with 3 interchangeable ear bud sizes.